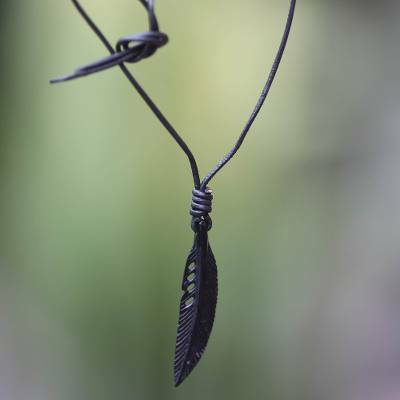 Carved by hand with extraordinary detail, a black feather graces a necklace for men. Bali's Andi Rachmansyah works in water buffalo horn to create the image and displays it on sleek leather cords. They can be adjusted in length by the sliding knots. You can find men's leather and horn pendant necklace 'Crow Feather Totem' by Andi Rachmansyah in jewelry categories such as Animal Themed Necklaces, No Stone Necklaces, Leather Necklaces, Horn Necklaces and Pendant Necklaces. Enjoy exploring these sections for other Novica treasures. The quality and craftsmanship is beautifully put together including the package. This necklace has been with me for a more than a little over a year and didn't break or wear. I did how ever ended up losing it (my own fault) and ended buying another. I consider it my good luck charm. It goes un notice this artist really spent the time making a quality and beautiful piece of art work. Thank you! I have had this necklace for at least 5 years, and lost my origional necklace when I left for the AIR FORCE. my original necklace was perfect, and wore it every day until I, sadly lost it. I found it again here, and bought 2 for me and my fiancÃ©, yet again They were just as I had remembered, and we both wear them daily since. I just bought 4 more for our future children, and in case we Lose ours or taken from us. It's our family good luck charm. And I'll wear one for the rest of my life, truly, an amazing quality. I wish I could find the artist to thank him personally. It has truly changed my life. Thank you. It's a quality piece I wear often and can attest to it's beauty and durability! "For a special friend called Crow"